The role of manufacturing in national economies has been receiving much greater attention in recent years. The context however is changing rapidly not least with the emergence of newly capable manufacturing nations and regions and new technological developments. It is timely therefore to revisit both the context of, and approaches to manufacturing strategies and policies. Japan and the UK find themselves facing similar challenges but from different starting points. Japan has developed a spectacularly successful manufacturing industry but now faces considerable challenges from new competitors. The UK, whilst historically strong in manufacturing had lost momentum but in very recent years has seen the need to re-invigorate this section of its economy. Both countries enjoy strong education and research infrastructures but seek to be more effective in the translation of new science into innovations and wealth creating companies and industries. Identify cooperation opportunities between the UK and Japan in the development of high value manufacturing. Share processes and findings concerning manufacturing futures. Gain a mutual understanding of the national manufacturing policy landscapes including industrial and sectoral strategies and research interfaces with industry. 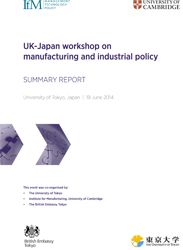 Develop frameworks to enable continuing dialogue between the UK and Japan.